Although 97 percent of the earth’s surface water is made up of oceans, humans use only a small percentage of the sea for food. Instead most people, especially those in Western cultures, rely heavily on land-based agriculture for food that result in deforestation, soil degradation, greenhouse gases, and depletion of freshwater supplies. In the August issue of Food Technology magazine published by the Institute of Food Technologists (IFT), senior editor/writer Toni Tarver writes about how the oceans are an untapped resource for food that is not only more eco-friendly but, in some cases, more nutritious than land-based foods. Fish and marine animals contain several nutritional benefits. Rich in vitamins A and D, selenium, zinc, iodine and iron, fish also contain essential omega-3 fatty acids, docosahexenoic acid (DHA) and eicosapentaenoic acid (EPA) which support proper brain functioning. In Asian and Nordic countries, where seafood is a dominant part of the cuisine, the life expectancy of both men and women is four to seven years longer than in Western cultures where seafood is consumed on average once a week. In addition rates of obesity, cancer, cardiovascular disease, and diabetes are much lower. Although there are between 300 and 500 different species of fish sold for human consumption, only three types make up more than 50 percent of all seafood consumed: shrimp, tuna and salmon (Seafood Health Facts 2015). Americans could benefit from expanding their seafood palate to include mackerel, mullet, sardines, oysters, mussels, clams, lionfish, and other unidentified edible species. Another untapped resource in the sea is seaweed. Seaweeds are marine algae that come in three forms: brown algae, red algae, and green algae. 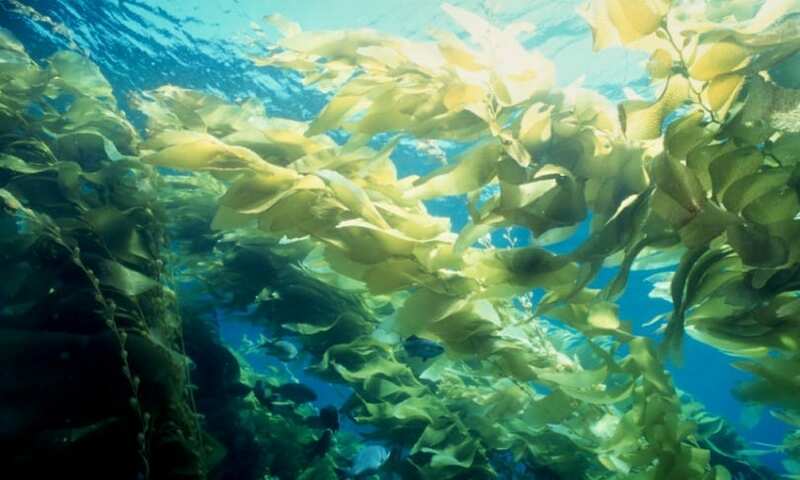 All three forms of seaweed are edible, but brown algae is the most widely consumed because many consumers eat kelp, which is a type of brown seaweed. In the U.S., seaweed is almost exclusively consumed as additives in processed foods. In Asian countries, Canada, and Europe people have been eating seaweed for hundreds of years in salads, soups, stews, and seasonings or in the form of a dried snack, puree, and salt replacement. Seaweed is rich in fiber, vitamins A, C, E, and K, iron, magnesium, niacin, omega-3 fatty acids and some seaweed strains have significant amounts of protein. In addition to its health benefits, seaweed is a sustainable food that doesn’t require the use of land and freshwater sources. March 29, 2019 - Feeding farm animals seaweed could help fight antibiotic resistance and climate change The Conversation - UKFeeding pigs seaweed could make them, us and the planet healthier without contributing to antibiotic resistance in bacteria.